Biometric Access Systems Pty. 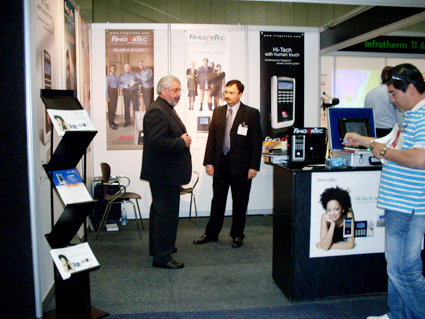 Ltd showcased FingerTec® fingerprint products at Security 2009, a renowned security conference and exhibition held in Sydney Convention & Exhibition Centre from 24th-26th August 2009. Security 2009 is Australia’s largest and most comprehensive security expo showcased over 150 brand and industry leaders offering complete solutions in access control, CCTV, theft prevention, data protection and risk management. Hundreds of security professionals were present to demonstrate the latest developments in security technology to over 4500 industry visitors. and high-rise buildings, installers and potential resellers for other sub regions within Australia and its surrounding countries. Considering the size of Australia, it’s great to have everybody from all around the country meeting at one place,” said Mr Pradip Gorasia, Director of Biometric Access System. “The TA200 Plus, i-Kiosk 100 Plus, AC900 and R2/R2i were a hit but some of the visitors were talking about a product equivalent to H2i with a good IP rating,” added Mr Gorasia, hinting for FingerTec to speed up the product development of the standalone compact fingerprint access system unit, H2i. “We will also introduce Q2i to those who are interested in TA200 Plus,” he said. 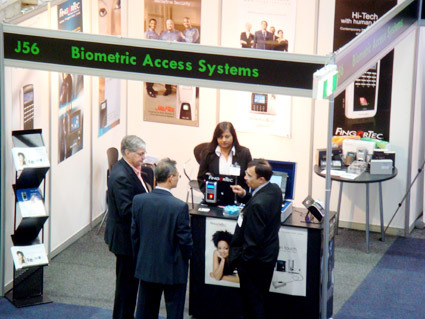 Biometric Access has been carrying FingerTec brand in Australia for more than two years now. Having an office located in the Sunshine State, Queensland, Biometric Access had explored various marketing activities suitable for the brand. According to Mr Pradip, marketing new products especially time attendance products in Australia is not easy. The laidback-mind-your-own-business attitude of the people coupled with the vastness of the land make an attempt to penetrate the market in the land down under a tough challenge and not forgetting to mention very costly. support from FingerTec Worldwide we are certain that FingerTec sales in Australia will show a significant improvement in this two years,” said Mr Gorasia to Hi-Tech Human Touch.